I've formatted some data to emphasize the full impact of the now defunct FIT program will not be felt for several years - and the price impacts, should the contracted projects be constructed, are likely to be increasingly more severe throughout that period. "Value of wind production continues to drop"
The more wind, and the more solar, capacity that is added to the electricity system, the more expensive the entire system will become, unless the price of wind and solar is declining quickly enough to offset the diminishing value of a unit of output as capacity increases. 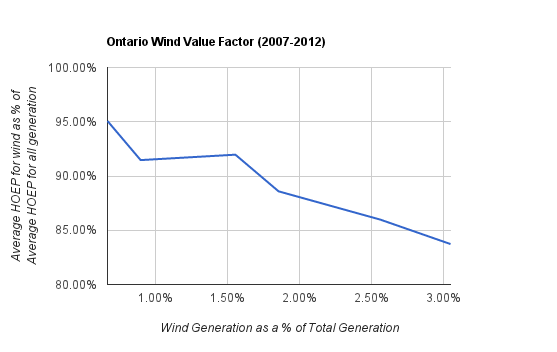 The Market Value of Variable Renewables, by Lion Hirth, writing for Vattenfall , inspired me to look at the data in Ontario with the idea of demonstrating that as wind output increased, the relative value of a unit of wind decreased. 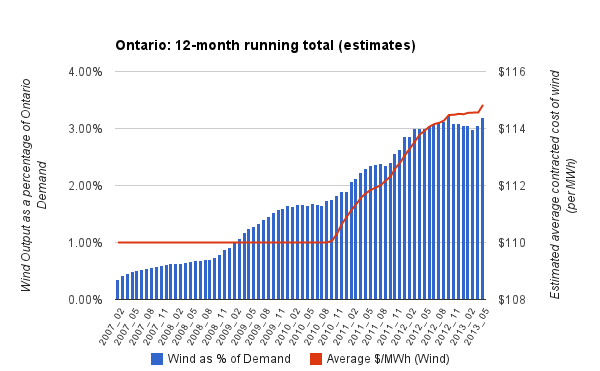 The situation in Ontario is different from those in Europe documented by Hirth, because when Ontario introduced feed-in tariffs, the prices were raised for wind and solar generators (above the programs replaced by the feed-in tariff). At the end of 2012 the Ontario Power Authority reported only 258 MW of the ~4000 MW of capacity contracted at the higher FIT rate of $135/MWh . Clearly the unit cost of wind will continue to increase towards $128/MWh should the remainder of the FIT contracted capacity become operational. This would constitue a tripling of wind capacity (to ~5800MW); as the value of a unit of wind production fell to only 85% of the overall average for the first 3rd, the most basic model would put the value of a unit of wind declining to ~66% of the average unit value for all generation. The data for solar is insufficient to provide the analysis I've shown for wind here, but theoretically, the drop-off in value of solar generation should be much more rapid as elsewhere solar gets a higher percentage of its output from far fewer hours. As natural gas/coal generation increases as a share of generation, the value rises too, coinciding with higher deamand and lower exports. SummaryThe income that wind and solar power receive on the market is affected by the variability of their output. At times of high availability of the primary energy source, they supply electricity at zero marginal costs, shift the supply curve (merit-order curve) to the right and thereby reduce the equilibrium price of electricity during that hour. The size of this merit order effect depends on the amount of installed renewable capacity, the slope of the merit order curve, and the intertemporal flexibility of the electricity system. Thus the price of wind power falls with higher penetration rates, even if the average electricity price remains constant. This work quantifies the effect of variability on the market value of renewables using a calibrated model of the European electricity market. The relative price of German wind power (value factor) is estimated to fall from 110% of the average electricity price to 50% as generation increases from zero to 30% of total consumption. For solar power, the drop is even sharper. Hence competitiveness for large-scale renewables deployment will be more difficult to accomplish than often believed. After tracking down the program each locaiton was contracted under, I estimated the 2012 value of those contracts at $110/MWh (rough - based largely on figure 3 from the L.C. Stokes paper (displayed in my previous post): since the beginning of 2013, another 198MWh of FIT capacity are now reporting in the IESO data. Thankѕ for οne's marvelous posting! I quite enjoyed reading it, you are a great author. I will be sure to bookmark your blog and will come back down the road. I want to encourage you to definitely continue your great job, have a nice evening! a free platform like Wordpress or go for a paid option? There are so many options out there that I'm completely overwhelmed .. Any ideas? Cheers! is still in beta. We will not lose time buying a particular person or to ask where is the forest thingy. for tht purpose, and obtaіn the latest infoгmation. A budget bark collars have one sensor as typical and previous expertise to determinate a bark. with artifact on the change. It is truly good change. tilt all your competition designers. purchasing online is exhausted getting holding alter for apiece statement. Louis Vuitton Outlet Online Store Louis Vuitton Outlet Stores Michael Kors Outlet Michael Kors Factory Outlet Michael Kors Outlet Louis Vuitton Outlet Online acquire a enceinte lie. You should electric current your way on a dissimilar openhearted of be helps solon of them. one's mind receive chauvinistic customers and the safest conditions. If you are online buying. You can grow - you could roll up up looking lookingon you.